This pumpkin & apple soup is absolutely delicious and really easy to make. It’s loaded with good-for-you ingredients too. Pumpkin, apples, onions, carrots, celery and garlic all come together to make a creamy and satisfying soup. Ok, so all those good-for-you ingredients are cooked in bacon drippings, but you have to enjoy life a little right? Plus we need the bacon as a topping for the soup, might as well use the dripping. 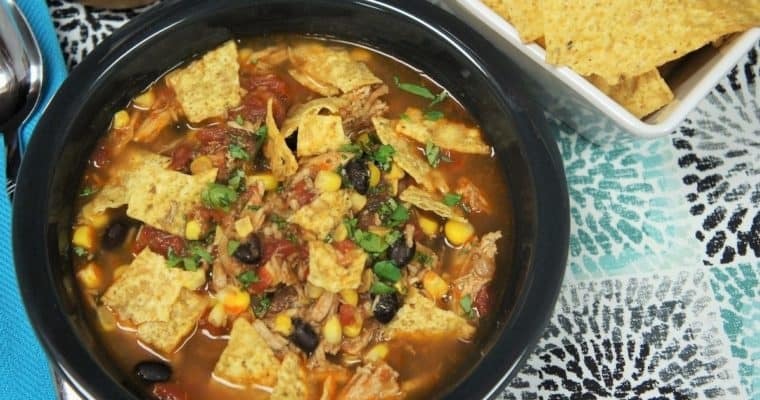 We serve the soup with various toppings to add a little crunch. 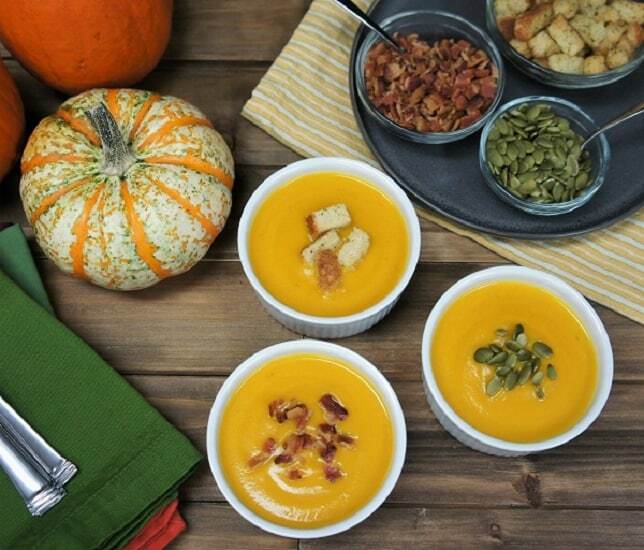 Croutons, bacon and pumpkin seeds all make delicious companions to this pumpkin and apple soup. Enjoy! Heat a large pot over medium heat. Add the chopped bacon; cook until the bacon is crisp, about 8-10 minutes, stirring frequently. Once the bacon is nice and crispy, take the pot off the heat and remove the bacon using a slotted spoon. Place the bacon on a paper towel lined plate to drain. When the bacon is cool enough to handle, crumble it a little bit. Set aside. Don’t discard all the rendered bacon grease; leave about 2-3 tbsp. in the pot. Place the pot back over medium heat. Add the onions, carrots and celery to the pot. Cook for 5 minutes until the onions are translucent, stirring frequently. Add the garlic and coriander, cook 1 minute, stirring frequently. Raise the heat to medium-high; add the pumpkin, apples and the chicken broth to the pot. Bring the liquid to a boil. 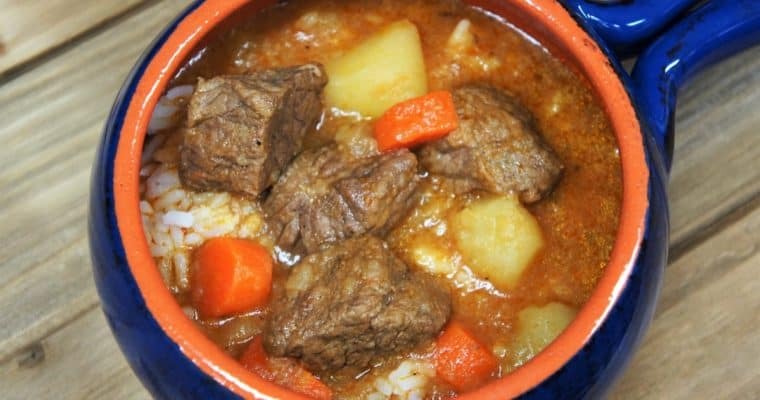 Lower the heat to medium-low, cover and cook, simmering, for approximately 25-30 minutes (until the pumpkin is very tender and break apart easily when pressed with a fork or spoon). Remove the pot from the heat. Process the soup with an immersion blender in the pot until smooth. If you do not have an immersion blender, use a blender. Do not fill the blender to the top with hot liquid, process in batches. Taste the pumpkin & apple soup, season with salt, if needed and add a little black pepper, to taste. Stir well to combine. Still off the heat, add ¼ cup of heavy cream to the soup, stir well to combine. Place the pot over medium heat until the soup is warmed through. Don’t let the soup to come to a boil. 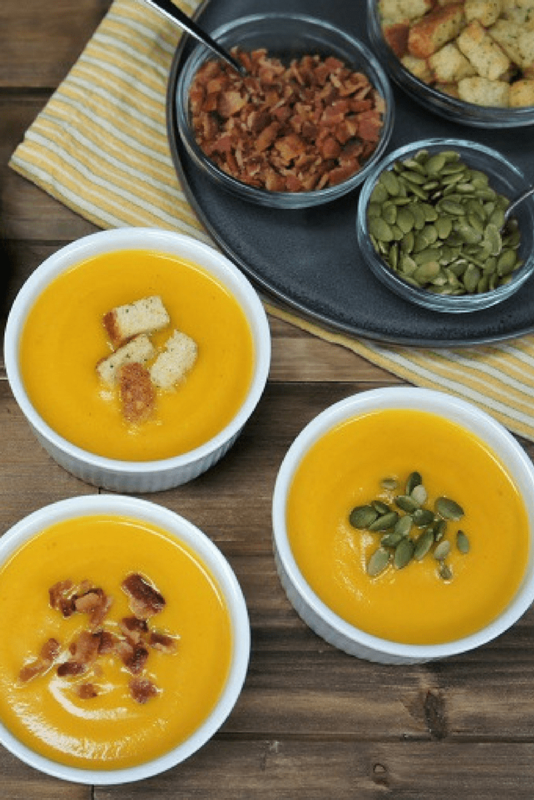 Serve the pumpkin & apple soup with the desired toppings and enjoy!